Sometimes I wonder just who my children think I am. The things they seem to think I’m able to do often baffle me. Like pulling money out of thin air at 10 pm because someone forgot to tell Mom that the field trip form and fee were due the following day. Or like most recently, when I asked Liam what he wanted to be for Halloween and he tells me he wants to be a pirate, ninja, turtle. Not a Ninja Turtle dressed up like a pirate. Oh no! A pirate with a turtle shell, and maybe turtle feet, who has a ninja mask, and maybe even ninja pants. Just who does he think I am? Martha Stewart? I love that he has this bottomless well of creativity. I just wish that sometimes it matched with my skills as a seamstress (non-existent) and my level of craftiness (beginner to intermediate). Because I love him, I will try my best to deliver upon on all his hopes and dreams for his costume this year, but I’m going to need a little help. 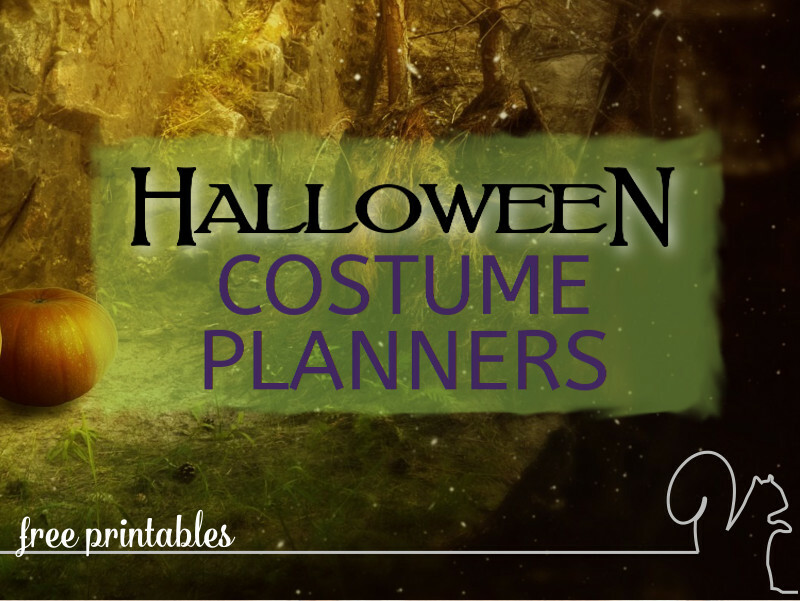 If you are making Halloween costumes this year, whether you’re a pro at it or still getting your feet wet, you too might find today’s Halloween Costume Planner printable a handy little tool to have. I think Halloween is a great opportunity to think outside the box and have a ton of fun. Both my boys have always preferred to sort of come up with their own ideas for Halloween costumes, and I really love that. Our oldest preferred easy to use costumes, like capes and face paint. Costumes that could be put together in different ways each year. Liam, on the other hand, loves to get really creative. It started a few years ago; the last year our oldest went trick-or-treating. There is always a year or two before they finally decide they are too old to trick-or-treat where they change their minds at the last minute. That’s what happened that year. Teen decided after school on Halloween that he wanted to go out trick-or-treating one last time. So we pulled together a costume from what we had on hand. A leather jacket, black pants, a motorcycle helmet and some mascara to make a stubble look on the face and we had ourselves a biker costume. That same year Liam had decided he wanted to be a vampire, and picked out a really neat cape and glow in the dark vampire teeth. I was going to paint his face on Halloween night. Then a few days before Halloween, he found his jack-o-latern costume from the year before and decided he wanted to be a vampire jack-o-latern. Halloween rolled around, and after seeing his big brother all dressed up as a biker he decided he wanted to be one too. So we added in some stubble to his face paint as well. I think he had more fun telling people what he was than he did actually trick-or-treating. Some of the reactions were really quite priceless, after all, it’s not ever day you see a vampire biker who is also a jack-o-lantern. Despite the fact that this seems to happen almost every year, I always find myself making multiple trips to the store for items we need for the costume, or searching through a pile of notes and scrap paper for where I jotted certain information down. This year I decided that I really needed something to help me keep track of all these things. So, I do what I always do when I need help organizing ideas and I made a printable that I’m calling my Halloween Costume Planner. I think the printable itself is very straight forward but I’ll walk you through it anyway. Measurements: I’m not a seamstress so I might have missed something that’s needed, or added something that isn’t. I tried to think of anything and everything I would have to measure for. This way they’re all jotted down and I don’t have to keep measuring every time I got to work on it. 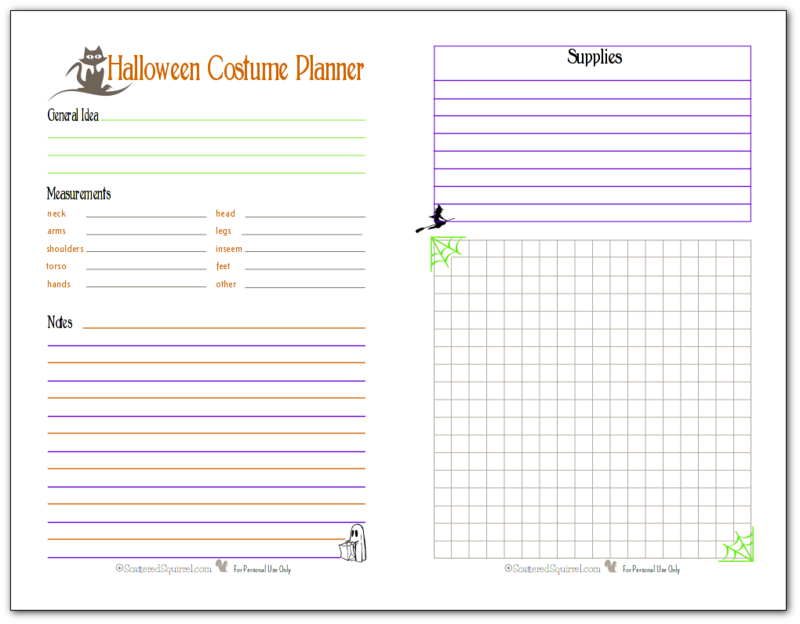 I made sure to make a half-size version of the Halloween Costume Planner printable for those of you who want one. 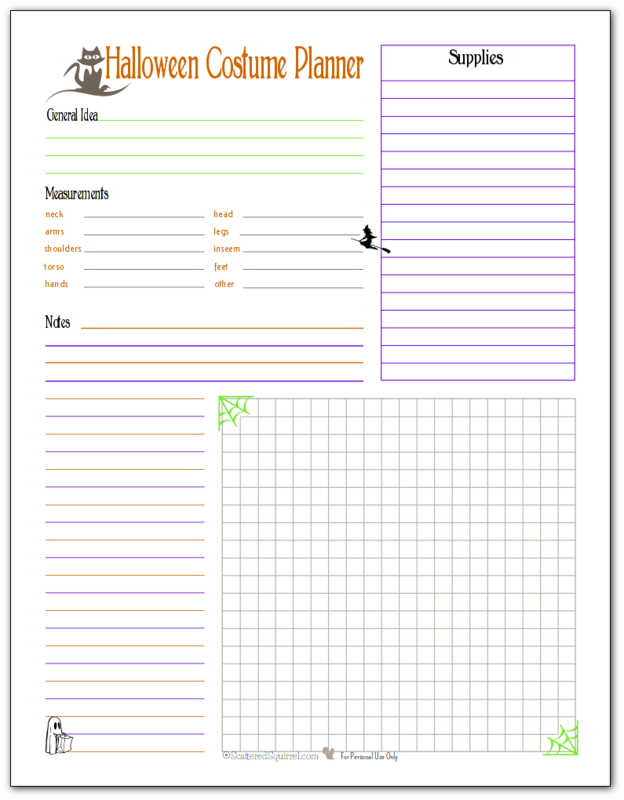 As always, to grab a copy of the printables for yourself simply click the pictures. I made a new section in my Holiday Planner for Halloween because it seems like every year it requires a little more planning. In that section I have a couple of lists that I just jotted down on lined paper. One of these years we would love to turn our front yard into a haunted house, hence all the lists of decorations. For now though I have my hands full with costume creation. Liam and I are going to be quite busy between now and Halloween putting together his costume. I foresee a number of “How to Sew” videos in my future. If you have any recourse to recommend, I’d love it if you would drop me a line in the comments. If you’re in the mood for Halloween fun check out some of the Halloween goodies my friends are sharing! If you can’t embrace your inner mad-scientist on Halloween, when can you embrace it? Check out these fun activities and enjoy some spooky science experiments with your kiddos. With Halloween falling on a Saturday this year, these are a fantastic way to pass the time between wake-up and trick-or-treating. Halloween is the perfect time of year to have some fun with your food. This collection of spider recipes is a great example of the fun you can have when making Halloween treats for kids (and grown ups too!) These would be awesome to bring to a party or just as a treat at home. Do you make your costumes for Halloween? Any tips you’d like to share? Pirate ninja turtle. Best Halloween idea ever, I’m pretty sure! I’ve a feeling my mom is quite pleased that I was never focused on what to be for Halloween – I don’t even remember half of them, it just was never a huge deal. This is incredible! 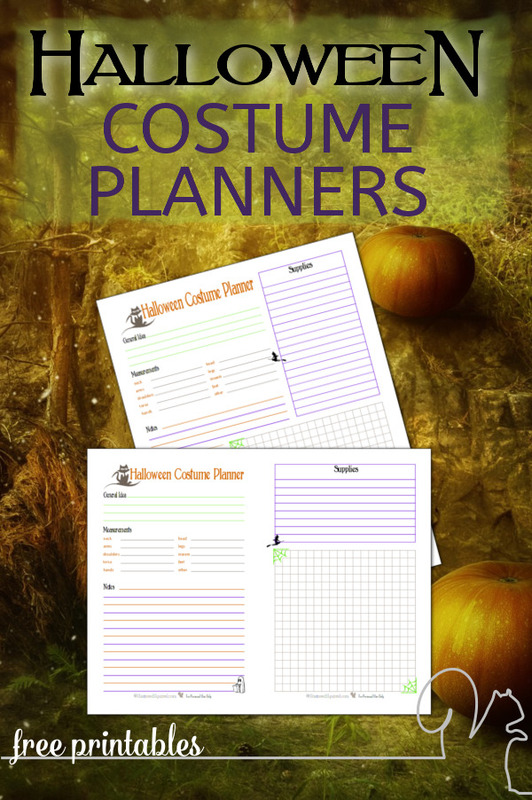 Thank you so much for the costume planner printable. This is going to save my sanity in the coming weeks! Hi!! Your inserts are so Awesome! happens all the time? I would love to have that! Hi CatC, thanks so much for your kind words! I’d be happy to make a non-Halloween version of it. I’m not sure when I’ll have it ready to go, but it’s definitely on my list. Is there anything you need added or changed to make it work better?